Ever since it was possible to tether a computer to a cell modem, it's also been possible to blow through one's monthly or service-plan limit and either run out of mobile data, be throttled to a trickle, or face expensive overage fees. 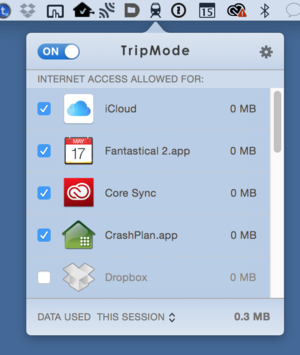 TripMode is the first easy-to-use OS X utility to help with that problem. It could do more, but for $8 (or $5 in its current sale), it does plenty. TripMode lists any app or service that tries to access the network, and lets you enable them; they're all disabled, or blacklisted, by default. This is a list of typical apps. When installed, TripMode appears in your system menu bar and monitors for network changes in Yosemite. Whenever you join a new Wi-Fi network or connect to a Personal Hotspot, TripMode activates and blocks all system-level and application network usage. The utility was built as an access whitelist, so all network usage is blocked until you allow it. You can check boxes next to any activity you want to approve from TripMode's dropdown menu. As new services or software tries to access the network or the Internet, more entries appear in the list. You may be surprised what appears, as many apps regularly poll servers in the background to check for software updates or event updates. TripMode can't populate the list fully initially, because it only "knows" that an app or service requires the Internet when that occurs. The utility's icon turns red whenever an app that's blocked tries to access the network. Individual software products have limited awareness of the network to which they're connected when you're on a Mac. 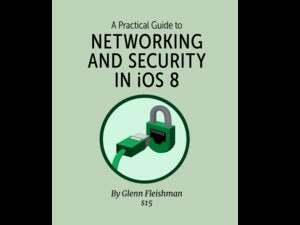 The iOS operating system and iOS apps typically are more careful about letting you pick and choose what's sent over cellular and what's not. 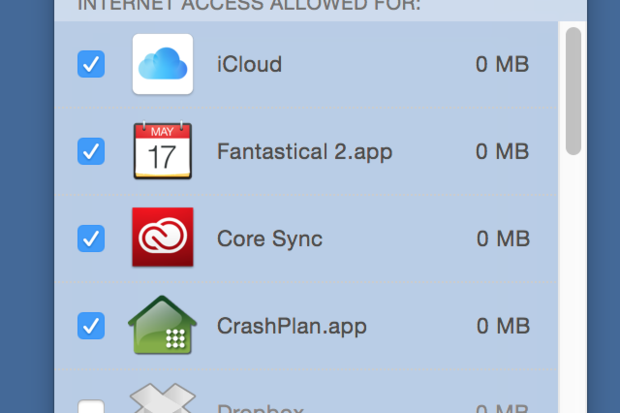 In OS X, Dropbox has a Pause button and CrashPlan, my backup software of choice, lets you blacklist Wi-Fi networks by name. But OS X more or less assumes it can always let apps use 100 percent of available throughput. Photos for OS X is a great and terrible example of that. Many apps want network access for syncing or checking in with remote servers for software updates. TripMode turns on automatically for every new network or new Personal Hotspot mode (such as a USB connection), but you can override the setting and it remembers that override. For instance, connect via USB to your iPhone or iPad to use its Personal Hotspot, and TripMode activates. If you click its switch from On to Off, however, the next time you connect via USB TripMode will remain off. It retains this information for every network to which you connect, restoring whatever state you left it in when you last connected. 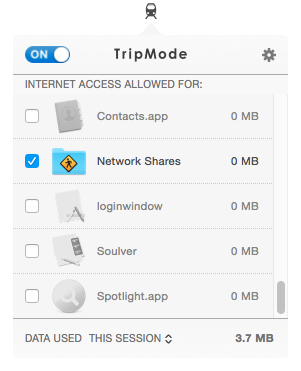 TripMode keeps track of data transferred while it's active, though not by network, just cumulatively. Still, it's likely you'll use it mostly to restrict excess usage on a mobile network, and thus its total remains useful. You can view data in the last session, the current day, or the current month. TripMode alerts you when it's turned on or off with a notification. The software could do more. Allowing blacklisting rather than whitelisting, as well as creating groups and sets for different circumstances or for easier organization, would be nice. I might want a "polite Wi-Fi network user" set when I'm at a local coffeeshop, "mobile throttled" for typical Personal Hotspot use, and "Starbucks Trenta usage" for those mega-coffee outlets equipped with gigabit Internet. Throttling apps could also be useful, though technically more difficult, allowing only a certain throughput or maximum data usage, which can be useful on a home broadband connection with caps or overages. These are quibbles and room for improvement in future upgrades or as paid in-app additions. What it does is nice at the price. On many American cellular plans, overage fees start at $15 per gigabyte, or three times the sale price of TripMode. TripMode can be used for seven days with its full functionality, after which point it throttles to allow only 15 minutes of use per day if a license isn't purchased. A handy app that helps you control your data usage over your Internet connection.